The opponents appear to be limited, so why make an attacking lead? 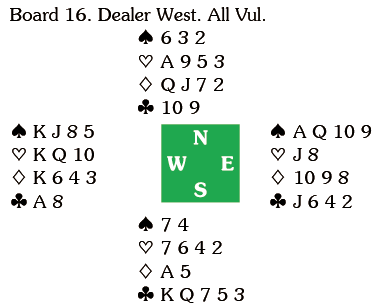 When North led the 3 declarer could win and force out the heart ace, establishing a discard for a diamond. On this layout that was enough for the game to make and it was worth 11 IMPs as in the other room Rodwell’s 1NT had been passed out. To defeat 4 North must lead a diamond. That’s tough, especially into a strong notrump, and leading from QJ combinations is right up there with leading away from a king. I’ll leave you to think about that, but would mention that if you are going to start with a diamond, a low one is not absurd. You are playing partner for something in the suit, and if dummy and declarer have something along the lines of A103 opposite K84 you will probably get away with it. 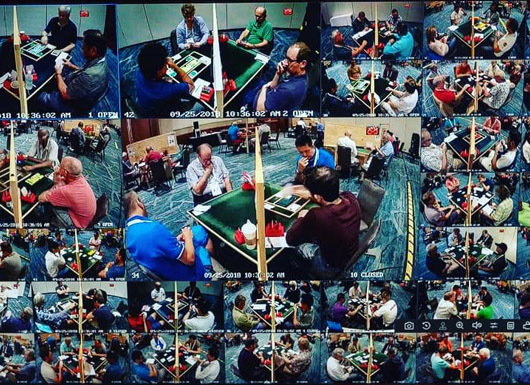 A glance at the other matches revealed that Robinson led the 10, losing 11 IMPs against the 1NT contract in the other room, as did Hurd. Smith and Sarniak failed to find the diamond lead, so flat in 4 . Dennis Bilde gets the accolade – he led the Q to pick up 12 IMPs (the 10 was Drijver’s choice – his partner had doubled 2 – which also caused Serek to lead a club and lose 11 IMPs).